The beautiful, rugged coast of Nova Scotia is lined with rocks smoothed by weather and surf in this scene. A lone gull rests on a rock among small evergreens. There is a sense of quiet calm in this little inlet of the sea. One almost wants to clamber up on one of those rocks to sit and enjoy a moment of perfect peace. This painting has been sold. 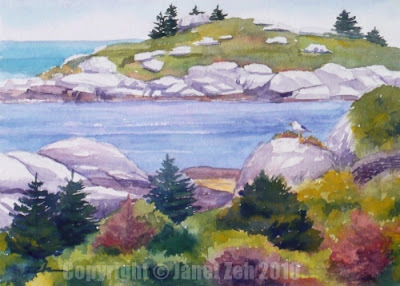 See more of my seascape paintings on my blog or check my Original Art Shop for paintings for sale. Thanks for stopping by.